Juvenile law is not criminal law. There are fundamental differences between these two areas of law. Many criminal defense attorneys are not aware of these differences nor aware of the significant ongoing changes in juvenile law enacted by the Texas legislature. The proper representation of juveniles is a complex and multi-disciplinary practice that requires knowledge of both civil and criminal law. A juvenile law attorney at minimum must have a thorough understanding of the relevant interacting Texas law, including the Juvenile Justice Code, the Penal Code, the Code of Criminal Procedure, the Rules of Evidence, the Controlled Substances Act and the Rules of Appellate Procedure. The attorney must also understand other issues such as the psychosocial and psychological development of adolescents. For a successful juvenile defense, all of these factors, including the facts of the case, must be thoroughly evaluated. Deferred prosecution may be an option for some. It is a contractual agreement with the prosecutor that can enable a juvenile to avoid an adjudication (conviction) on his juvenile record. If a juvenile fulfills the requirements of a six month deferred prosecution, then the prosecutor will non-suit (dismiss) the case, and the juvenile then has the immediate right to petition the court to seal his records. Per rules of the District Attorney, the juvenile court prosecutors cannot agree to such a resolution for many misdemeanor cases and all felony cases. Even though the prosecutor is opposed to deferred prosecution in many cases, James (Jim) Sullivan is effective in persuading the court to grant deferred prosecution anyway. It is natural that teenagers go through a period of rebellion as they make their way through adolescence, and of course some teens rebel more than others. However, if your child is on probation, it is very important that he follow the rules. If he breaks the rules, he may be removed from his home and placed in a juvenile facility such as at the Burnett Bayland Reception Center (usually up to three months), juvenile boot camp (four to six months), youth village (usually up to three months) or for felony cases commitment to the Texas Youth Commission (TYC) up to the age of 19. Obviously, each case is different and must be evaluated on an individual basis. Many parents have the opinion that their child got himself in trouble despite their best efforts and therefore they are not willing to spend any money on a defense attorney, or worse they encourage their child to talk with the police without first consulting an attorney. These approaches, however, have lead to many heartbreaking realizations later on. Your child is a blessing. Decisions made during these difficult years of his adolescence are critical to his future well being. Your child needs an attorney who not only can relate to and counsel him but also who specializes in juvenile law and can effectively represent him. Be proactive and make your decision on retaining an attorney wisely. Hempstead, Texas Juvenile Defense Attorney James Sullivan is very passionate about defending, counseling and inspiring his juvenile clients to get on the right path, to stay in school and to plan for the future. He wants all of his clients to have a successful future, just as all parents want their children to do better than they did. He strives to keep his clients at home and to keep their record clear, although he realizes that some are so out of control that for their own safety they need to be placed in a secure facility or residential drug treatment center. Many teens need the adversity and discipline of an out of home placement such as at boot camp to learn to accept responsibility for their actions, to stop blaming others for their behavior and to build character. 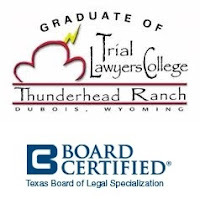 Texas Juvenile Lawyer James Sullivan is Board Certified in Juvenile Law by the Texas Board of Legal Specialization since 2004. Sullivan handles all juvenile offenses in the juvenile courts in Waller county and throughout the state of Texas. Whether your child is charged with a felony or a misdemeanor, James Sullivan can provide effective representation and advice. To schedule a consultation, call 281-546-6428.